Badoglio, Pietro (1948). Italy in the Second World War; Memories and Documents. London/New York/Toronto: Oxford University Press. OCLC 1369527. Beevor, Antony (1992). Crete: The Battle and the Resistance. London: Penguin Books. ISBN 0-14-016787-0. Ceva, Lucio (1975). La condotta italiana della guerra: Cavallero e il Comando supremo 1941–1942 [The Conduct of War: Cavallero and the Supreme Command 1941–1942]. I Fatti e le idee. Milano: Feltrinelli. OCLC 1955885. Churchill, Winston S. (1948). The Second World War: The Gathering Storm. I. London: Cassell. OCLC 219846129. Churchill, Winston S. (1949). The Second World War: Their Finest Hour. II. London: Cassell. OCLC 264739165. Creveld, Martin van (1973). Hitler’s Strategy 1940–1941: The Balkan Clue. Cambridge: Cambridge University Press. ISBN 0521201438. Fowler, Will (2003). The Balkans and North Africa 1941. Blitzkrieg. London: Ian Allan. ISBN 0-71102-946-6. Führer Conferences on Naval Affairs 1939–1945. London: Greenhill Books. 1990. ISBN 1-85367-060-X. 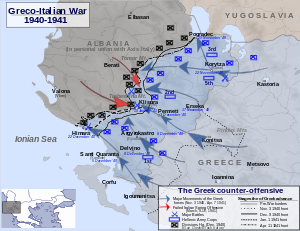 An Abridged History of the Greek-Italian and Greek-German War, 1940–1941 (Land Operations). Athens: Army History Directorate Editions. 1997. OCLC 45409635. Higham, Robin (2015) . Diary of a Disaster: British Aid to Greece 1940–41. Lexington: University Press of Kentucky. ISBN 9780813192918. Hitler, Adolf; Bormann, Martin (1961). Genoud, François, ed. The Testament of Adolf Hitler: The Hitler–Bormann Documents, February–April 1945. London: Cassell. OCLC 185760846. Keegan, John (2005). The Second World War. Penguin. ISBN 0-14-303573-8. Kershaw, Ian (2000). Hitler, 1936–1945: Nemesis. London: Allen Lane. ISBN 0-71399-229-8. Kirchubel, Robert; Gerrard, Robert (2005). Opposing Plans, Operation Barbarossa 1941: Army Group North. Campaign. II. Oxford: Osprey. ISBN 1-84176-857-X. Knox, MacGregor (1984). "Fascist Italy Assesses its Enemies, 1935–1940". In May, Ernest R. Knowing One’s Enemies. Intelligence Assessment before the Two World Wars. Princeton, NJ: Princeton University Press. ISBN 0-69104-717-0. Lamb, Richard (1998). Mussolini as Diplomat. London: John Murray. ISBN 0-88064-244-0. Mack Smith, Denis (1974). Mussolini as a Military Leader. Stenton Lecture. Reading: University of Reading. ISBN 0-70490-204-4. Mack Smith, Denis (1976). Mussolini’s Roman Empire. London/New York, 1976: Longman. ISBN 0-58250-266-7. Mack Smith, Denis (1983). Mussolini. London: Grenada. OCLC 655460413. Muggeridge, Malcolm, ed. (1948). Ciano's Diplomatic Papers. London: Odhams. OCLC 753172847. Muggeridge, Malcolm, ed. (1947). Ciano's Diary 1939–1943. London: Heinemann. OCLC 6941231. Papagos, Alexandros (1949). The Battle of Greece 1940–1941 ("Alpha" ed.). Athens: J. M. Scazikis. OCLC 3718371. Payne, Stanley G. (1995). A History of Fascism 1914–45. London: UCL Press. ISBN 0-29914-874-2. Sullivan, Brian R. (2002). "Where One Man, and Only One Man, Led. Italy's Path from Non-Alignment to Non-Belligerency to War, 1937–1940". In Wylie, Neville. European Neutrals and Non-Belligerents during the Second World War. New York: Cambridge University Press. ISBN 0-52164-358-9. The Balkan Campaign 1940–1941. West Point, NY: Department of Military Art and Engineering. 1948. OCLC 680001502. Walker, Ian W. (2003). Iron Hulls, Iron Hearts; Mussolini's Elite Armoured Divisions in North Africa. Ramsbury: The Crowood Press. ISBN 1-86126-646-4. Weinberg, Gerhard L. (1994). A World at Arms: A Global History of World War II. Cambridge: Cambridge University Press. ISBN 0-521-44317-2. Wint, Guy; Pritchard, John (1999). Calvocoressi, Peter, ed. The Penguin History of the Second World War. Penguin Books. ISBN 978-0-14-195988-7. Wylie, Neville, ed. (2002). European Neutrals and Non-Belligerents during the Second World War. New York: Cambridge University Press. ISBN 0-52164-358-9. Zabecki, David T., ed. (1999). World War II in Europe: An Encyclopaedia. Routledge. ISBN 978-0-824-07029-8. Carrier, Richard C. (October 2003). "Hitler's Table Talk: Troubling Finds". German Studies Review. 26 (3): 561–576. doi:10.2307/1432747. ISSN 2164-8646. JSTOR 1432747. Ceva, Lucio (1979). "La campagna di Russia nel quadro strategico della guerra fascista" [The Campaign of Russia in the Strategic Framework of the Fascist War]. Politico. Saggi di Enzo Collotti et al. OCLC 848260125. Creveld, Martin van (1971). "25 October 1940: A Historical Puzzle". Journal of Contemporary History. Sage. 6: 87–96. doi:10.1177/002200947100600306. ISSN 0022-0094. Creveld, Martin van (1974). "Prelude to Disaster: The British Decision to Aid Greece, 1940–41". Journal of Contemporary History. Sage. 9: 65–92. doi:10.1177/002200947400900303. ISSN 0022-0094. Sadkovich, James J. (1989). "Understanding Defeat. Reappraising Italy's Role in World War II". Journal of Contemporary History. London: Sage. 24: 27–61. doi:10.1177/002200948902400102. ISSN 0022-0094. Sadkovich, James J. (1 May 1994). "Italian Morale During the Italo-Greek War of 1940–1941". War and Society. Langhorne, PA: Gordon and Breach. 12 (1): 97–123. doi:10.1179/072924794794954323. ISSN 0729-2473. หน้านี้แก้ไขล่าสุดเมื่อวันที่ 14 สิงหาคม 2560 เวลา 04:04 น.